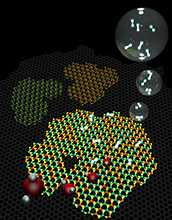 Molecular models representing a 2D heterostructure made of graphene (gray background hexagonal lattice) and islands on top of hexagonal (graphene) WS2 and MoS, as well as an alloy of the two. A team of scientists from PennState University and Florida State University have come one step closer to inexpensive, clean hydrogen fuel with a lower cost and industrially scalable catalyst that produces pure hydrogen through a low-energy, water-splitting process. 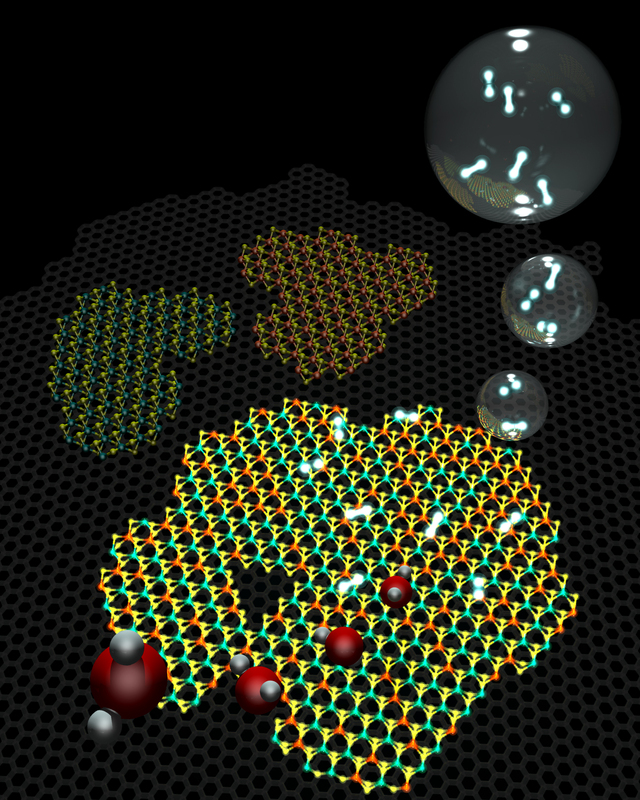 "Energy is the most important issue of our time, and for energy, fuel cells are crucially important, and then for fuel cells, hydrogen is most important," said Yu Lei, a PennState doctoral student and first author of a paper published describing the water-splitting catalyst she and her colleagues theoretically predicted and then synthesized in the lab. "People have been searching for a good catalyst that can efficiently split water into hydrogen and oxygen. During this process, there will be no side products that are not environmentally friendly." The water splitting process uses a very small amount of electrical energy applied to an electrode immersed in water. Using this small potential, the protons in the solution can be absorbed onto the surface of the catalyst. Then two protons will migrate together to form a hydrogen bubble that rises to the surface and releases the hydrogen. Hydrogen fuel cells can boost a clean-energy economy not only in the transportation sector, where fast fueling and vehicle range outpace battery-powered vehicles, but also to store electrical energy produced by solar and wind. This research is another step forward to reaching that goal. The research was supported in part by the National Science Foundation (NSF) (grants EFMA 15-42707 and EFMA 14-33311).